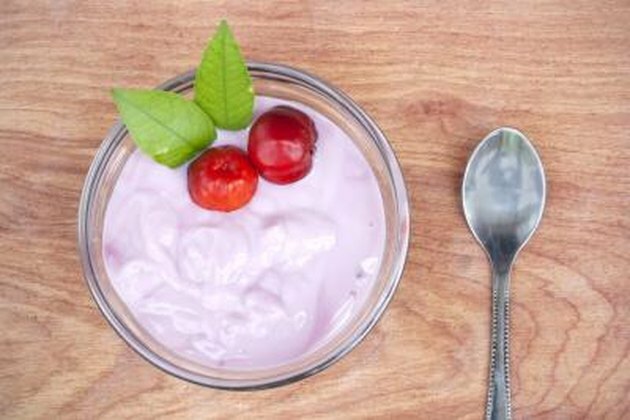 Research shows that eating yogurt can shorten the length and severity of diarrhea caused by digestive complications, according to AskDrSears.com. Yogurt contains live and active cultures that help maintain the health and normal functionality of your digestive system. Because viral intestinal complications cause nausea, vomiting and diarrhea, eating yogurt with other easy-to-digest foods can help ease your symptoms. Before treating a stomach problem with diet modification, talk with your doctor. Intestinal infections are one of the most common causes of gastrointestinal complications. A stomach virus is also referred to as the stomach flu and is obtained from human-to-human contact or by touching an infected object. You can also develop intestinal infections by drinking or eating contaminated water or food. A stomach virus is a viral infection that causes swelling and inflammation throughout your digestive tract, while food poisoning is commonly caused by a bacteria or parasite. Most symptoms last from one to three days. One of the primary treatment approaches is to modify your diet to promote proper digestion. Eating yogurt is a good food if you have the stomach flu. Yogurt can help shorten the length and severity of your symptoms, such as diarrhea and nausea. Yogurt contains probiotics, good bacteria found in your gut that help regulate your digestive system. AskDrSears.com states that eating plain yogurt can provide a sufficient amount of probiotics. Avoid eating yogurt high in sugar or high in fiber because this can aggravate the lining of the intestines. Eat small amounts often. Eating too much yogurt too fast can cause irritation in the digestive tract. Not all yogurt is beneficial, according to CBS News. Many yogurt brands are high in sugar and fat, and while they may provide some good bacteria, the fat and sugar in the yogurt may worsen diarrhea. If you eat yogurt to treat a stomach virus, use low-fat, plain yogurt. If you're lactose intolerant or have a milk allergy, you can purchase probiotic supplements from the pharmacy to avoid any adverse reactions. Soy yogurt is another alternative if you cannot drink dairy products. If you cannot keep any food in your stomach, stop eating and drinking for a few hours before resuming eating. You are at risk of becoming dehydrated from diarrhea. Call your doctor if you develop symptoms such as dry mouth, fatigue or lightheadedness. Can I Eat Some Yogurt With Gastroenteritis?